What You Can Do with Windows Flip And Windows Flip 3D? 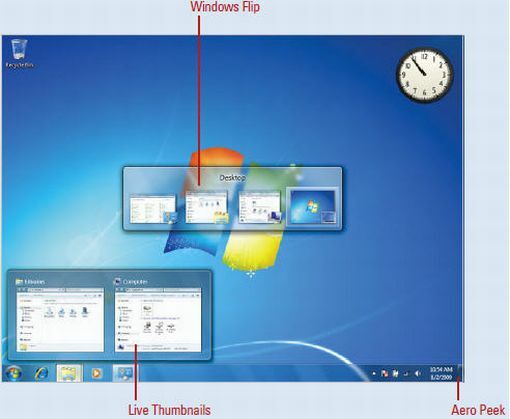 Windows 7 Aero provides two ways to manage windows: Windows Flip and Windows Flip 3D. The Flip and Flip 3D (also known as the Window Switcher) features provide you with two quick methods for activating the window you want to work by displaying it on the top of the others. The following describes the different between both of the flipping method. The Windows Flip feature is not new as the previous versions of Windows already can do the same thing but with Windows 7, this feature has improved. Windows Flip allows you to flip through open windows, providing a Live thumbnail of each window, rather than just a generic icon and file name (as in older versions). To see the effects, open three different programs. Press the Alt + Tab keys, live thumbnails appear to make it easier to quickly identify the window you want, particularly when multiple windows of the same kind are open. The selected live thumbnail appears on the desktop and all other windows appear transparent. Continue pressing the Alt + Tab keys until the program you want to make active is selected, release the keys, and the program becomes active. If you are running the Windows Aero desktop, you can use Windows Flip 3D to cycle through running programs and select the one they want to make active. Windows Flip 3D creates a view of your open windows in a three-dimensional stack on your desktop. By pressing the Windows + Tab keys, you can flip through the open windows to quickly locate and select the window you want. If you are using scroll mouse, you can also use the scroll wheel on your mouse to flip through open windows in a stack and select the one you want. Press the Windows + Tab keys. The running programs are displayed in an overlapping across the screen. Continue to press the Windows + Tab keys until the program you want to make active is at the front of the stack. Release the keys, and the program becomes active. 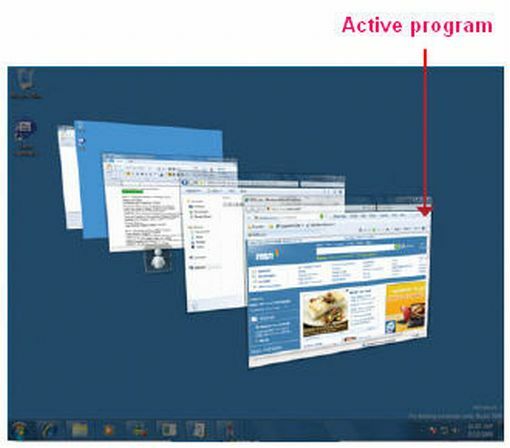 Beside Windows flip, Windows 7 aero also have the features called Aero Peek and Aero Snap.